The recipe is for Lebanese lemon-parsley bean salad. You can get it here. What I loved about this recipe (besides its being healthy and vegan) is that it’s adaptable and flexible. I didn’t pay much attention to the measurements provided for the ingredients (this isn’t a cake after all) and it still turned out delicious. Instead of olive oil I used macadamia oil. It’s a delicious substitute, but make sure you either use it sparingly or cut it with enough lemon juice, otherwise it will drown all the other flavours. Kate gives the option of adding either dill or mint. I chose the latter, because I prefer it and because we have tons in the vegetable garden (my sister-in-law is currently trying to make mint oil with it). I left out the salt and used ground cayenne pepper instead of the red pepper flakes. The two are interchangeable as red pepper flakes usually have a cayenne pepper base anyway. Oh, I also discovered a pretty neat kitchen hack! I squeezed the lemons with my hands, which helped reduce the awful onion smell on them. Working in the kitchen can generate a lot of waste – both organic and otherwise. Managing waste starts right in the beginning of preparing a dish: with the shopping. Here’s how I made my green dish even greener. Red onions were purchased in a netted bag, which I can reuse when shopping for fruit or vegetables. Celery and mint came from our vegetable garden. Lemons came from my sister-in-law’s sister’s garden. Garlic was purchased fresh and not placed in a plastic bag. Organic remains were thrown in the compost. A glass bottle and tins were recycled. Leftover mint was placed in ice trays with water, and then in the freezer – to add to a glass of water, juice, or even a gin and tonic, once frozen. 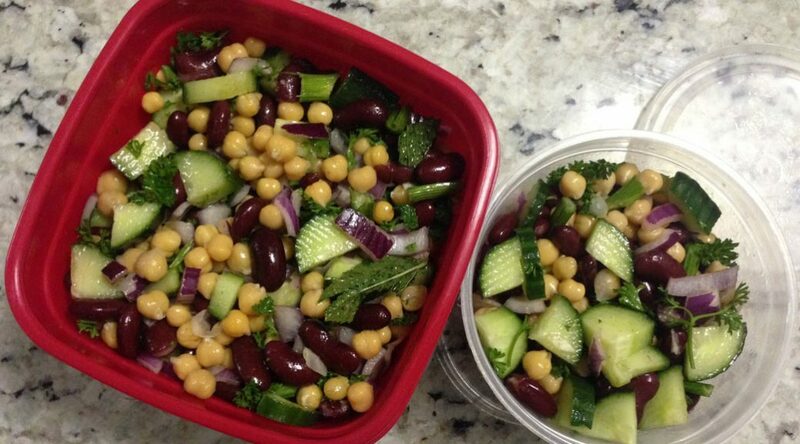 Completed salad was placed in plastic containers, which are reused and not recycled and definitely not thrown away. Love Lebanese food? I write about it in my review of Hanan Al-Shaykh’s The Locust and the Bird here.